Summer is starting to wind down and the first round of Back to School ads are already starting to run. While many of you are still soaking up the last moments of Summer soon you will start thinking about your school wardrobe. If you don’t have an idea on how to get started I am here to offer my assistance. Follow along as I share some helpful advice to make sure you start your first day of class on a fashionable foot. Save some much needed time in your routine by planning out your outfits ahead. During my undergrad days, it was a huge timesaver, especially for my early morning and weekend classes. Whether you are presenting a presentation or taking your exam take away some of the stress by not having to worry about what you are going to wear. Nothing pulls together the right outfit like adding a cute bag or tote. There are some great choices whether you go for a bold print or something a little more understated. Plus, for my college age fashionistas, a tote or messenger is a great alternative for to a regular backpack if you don’t have many books. Some of you may have to wear school uniforms & I can personally relate to those days. However, you can add your personal touch without breaking the rules of course. Find your favorite accessory (hair, watch or etc.) to highlight your personality. You can also pick out your favorite backpack to add to the mix. Whether you are starting middle or high school you will be starting the phase where you will be developing your own fashion sense if you haven’t already. Be yourself. Unless you are violating your school’s dress code or etc. wear, what makes you comfortable. Don’t try to force if it doesn’t work for you. That’s the beauty of fashion to showcase your personality. You know we here at My Own Sense of Fashion are big fans of that. Hence the name. Some of you might be inspired by the looks you see in ads on TV or the latest issue of a fashion magazine. If you can’t exactly purchase your favorite outfit why not find a similar look. For those of you who are crafty, you can always make your own version in a DIY session. I know back to school shopping isn’t always your favorite especially since it is a huge reminder that summer is ending. However, there is a bright side and that getting some great deals. Most retailers have some awesome back to school sales. Another great deal to look out is the Tax-Free Weekend if your state is one that participates. Even if you are wearing uniforms you will want to stock up especially for the school year. Whether you are wearing your favorite pair of jeans or a uniform make sure you look your best. Your clothes & how you wear them can really speak volumes. Think about what kind of perception you want to give to others. These are some of my tips. Hopefully, they will help you put your best foot before heading to your first day of classes. Good luck to you in the new school year. Did you find these tips helpful? 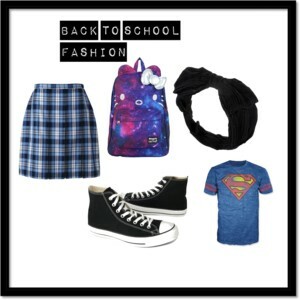 How do you prep for Back to School fashion? Let us know in the comment section below.